Photographs are listed in reverse order by the date of the event at which the photographs were taken. Scout Pictures - Forgotten a name or wondering who is that scout? Find out here. April 28 - Orienteering at Camp Belzer. January 12 - Rocket launching at Heritage Park, Fishers. There was supposed to be sledding also but that's hard to do when it's 60 degrees. December 24 - Setting up Luminaries at Fishers United Methodist Church. December 19 - Governor's Luncheon. December 11 - Holiday Pitch In at Camp Belzer. November 10 - Cave outing. Buckner Cave, Bloomington, In. October 19 - Clifty Falls campout. Thanks to Mr. Bromm for the pictures. August 18 - Cleaning the bus. August 4 - USS Silversides outing. We spent the night on a World War II submarine. July 27 - Andrew J's Minisino crowning. 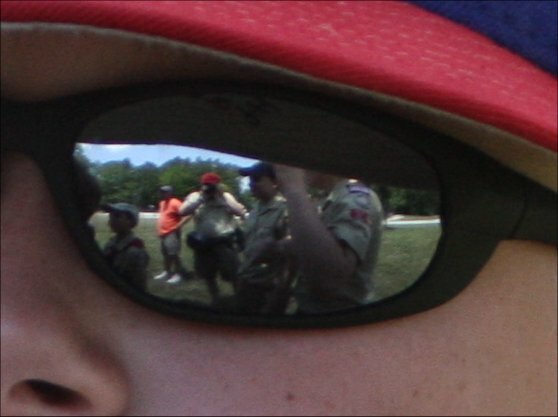 July 8-14 - Summer camp at Ransburg Scout Reservation. June 23-24 - Fishers Freedom Festival. We sell hot dogs and brats and march in the parade. June 8-22 - Philmont trip. Five scouts and 4 adults from troop 109 went to Philmont as part of the Crossroads of America Council contingent. Our troop was teamed with 2 scouts and one adult from troop 336. May 19 - Young Eagles Flight. This is the second time in less than a year we had the opportunity for a free flight courtesy of the Young Eagles group. May 11 - 13 - Turkey Run campout. Thanks Mr. K. for the great photos. April 1 - The 2012 Philmont crew met for a practice hike. March 11 - Tony P.'s Eagle project. Tony made a pet recreation center for the Hamilton County Humane Society. March 5 - The 2012 Gathering of Eagles dinner. January 14 - Sledding and rocket launching at Heritage Park in Fishers. We were joined by Webelos guests in a fun filled morning of sledding and rocket launching. January 22 - Jeremy's Eagle Court of Honor. Jeremy was the 4th Troop 109 scout to earn the rank of Eagle in 2012. November 19 - Setting up the Christmas tree lot. November 15 - Court of Honor. October 25 - Troop meeting, pumpkin carving with Webelos guests. October 22 - Jordan Eagle Court of Honor. October 8 - Andrew J Eagle Court of Honor. September 23 - 25 - Feast of the Hunters Moon camp out. August 13 - Nick B. Eagle project at Richey Woods. August 7 - Climb Time and 2012 planning conference. August 6 - We participated in the Del-Mi district catapult contest. It had been over 10 years since the troop had attended the competition. We finished 2nd overall. June 18 - Troop mobilization. To satisfy one of the Emergency Preparedness merit badge requirements we held a troop mobilization exercise. Scouts searched for "victims" and applied first aid as needed. June 16 - Andrew J. Eagle Board of Review. April 23 & 30 - Andrew J. Eagle project. We made and hung 30 picture frames for Lantern Road Elementary school. February 25 - 27 - Timber Ridge Ski Outing - Skiing and sledding in Michigan. This was our first trip to Timber Ridge. We'll definitely be back. February 19 - OA Ceremony Team - Our OA ceremony team performs at a crossing over for pack 170. October 30 - Ian B. Eagle project - An old fire site was reclaimed and a new fire ring built. October 12 - Troop meeting. - Carving pumpkins. For the 2nd year in a row, we were joined by visiting Webelos and their parents. September 17 - 19 - Chain O' Lakes camp out. We were joined by Webelos for hiking, fishing and geoocaching. September 12 - For Jonathan T's Eagle project we blocked off deer paths to human access in Ritchey Woods with a few temporary fences and one big permanent one. August 28 - We sold concessions at the Fishers Car Show. August 15 - One of our scouts participated in the dedication of the America Legacy Project bridge at the Indiana State Fairgrounds. August 20 - August 22 - Indiana Dunes camping trip. We camped at the Dunes and rode the train into Chicago to tour the Museum of Science and Industry. July 29 - August 4 - Florida Sea Base high adventure trip. Every year we try to take a high adventure trip. This year a group went on the Out Island Adventure at the Florida Sea Base. April 17 - Catapult construction. We built a catapult to take to the spring camporee. April 17 - Adopt a Road. One of the troop service projects is to pick up trash on Lantern Road between 96th Street and 106th Street three times a year. April 4 - Final Four Dribble. Several scouts participated in the Final Four Dribble. They dribbled basketballs from the NCAA headquarters to the Convention Center as part of the Final Four weekend festivities. March 27 - Indianapolis Ice Game and color guard. We were invited to be the color guard at the last game of the season for the Indianapolis Ice. March 19 - 21 - Camp Redwing camping trip. This was the first outing for the scouts that crossed over to Troop 109 in February. Twenty plus scouts and ten plus adults made this the largest outing in a long while. The new scouts got a good start towards earning their Tenderfoot, Second Class and First Class ranks as well as earning their Firem'n Chit and Totin' Chip cards. January 23 - Former troop 109 Scoutmaster Frank Spall is presented Silver Beaver award at the University of Scouting. December 24 - Luminary set up. - Each Christmas, we set up and take down luminaries at the church. December 5 - Sports of All Sorts outing. - Dodge ball, pizza and bowling. It doesn't get much better than this. We were happy to have Webelos visitors share in the fun. November 11 - Setting up the Christmas tree lot. October 27 - Troop meeting. - Carving pumpkins. We were joined by visiting Webelos and their parents. September 25 - 27 - Camping trip to Wright Patterson Air Force Base - We camped on the base near the flight line. We were joined by visiting Webelos and their parents. June 27 - Fisher's Freedom Festival food both. May 15 - 17 - Summit Lake camping trip. Canoe skills and fishing merit badge. May 9 - Reach For Tomorrow. A program of Learning For Life. January 31 - Winter Camporee at Camp K co-hosted by Troop 109.